1st March 2015 I joined my local cycling club, just seven days later I go on my first club ride and get spat out of the back of group four, and I mean spat out. Since then a lot has changed. I have been cycling the year before with people in the village, but the winter came and the social group when it own ways. I had also completed London to Brighton and Ride London that year so the summer was a good one in the bike, but the lack of training over the 2014/15 winter didn’t help and certainly was a factor of me being out the back door in that first club ride back in March 2015. The following week I remember thinking work harder and keep on the wheel of the rider I front, it worked as I made it back within the group. Well small progress at least. A few weeks went by and I was getting used to cycling in a group and was coping quite well. A decision needed to be made, group 3? This group moves at an extra 2mph aver age speed and the no drop policy is gone. Oh well the new wheels had arrived and they helped my speed so I made the decision to step up, just one month into my membership! The route was an out and back on a flat and as I know now a fast ride. We reached the out part travelling at 18.5mph average and the previous weeks it was 15mph! Yes this had taken its toll and again I was out the back of group 3 in the last 10 miles, nothing left in the tank and I was empty. It was after this ride that RP had provided some very useful advise via email the following day, use a cadence meter and change the saddle height a bit (upwards), OK advise was great fully received and quite frankly required, as I found myself not good enough for group 3 and not being able to push in group 4. The final bit of advise was the fact me mentioned I would be in group 2 by September. I smiled, but thought this would be a hard ask. The advise worked, no suprise and I was able to stay in the front of group 4 and do most of the work for the next few weeks, before making another attempt at group 3. By now I had been cycling with the club for about six weeks and with the commute to work on the bike I was getting stronger and quicker. However still didn’t believe the “in group 2 by Septemer bit”. 26th April 2015 my second attemp in group 3. Progress, success, not dropped. I felt like I had achieved the first major success at the club, well my success anyway. By now I was loving the club rides and was starting to make new friends which is the other great thing about cycling, the social aspect. There was a dinner and dance the first one the club had organised so it was a good excuse to get to know more people and feel part of the club. A lovely evening was had by all and yeast there was a club ride the following morning to help clear the head. I had also felt more comfortable and had agreed to step up and learn how to lead rides. Within a few weeks I was assisting the group 4 ride and learning the ropes. When I was not learning how to lead rides I rode in group 3 trying to learn form the more experience club cyclist as well as push myself forward. After all I was due to Ride London in August so needed to ensure I had the miles in my legs to do myself justice. It is mid May and a few club member s were of participating in various events across the UK and Europe. In just 2 weeks (start of June) the Tour of Cambrideshire was taking place and a large club contingent was going 44 riders, and yes I was one. I had only ever ridden on closed roads once before so the experience was good to pass up. To add extra pressure it was also the UK qualifying leg for the world amatur road race championships in Denmark later in the year. The first two hours flew by with an average over 20mph! Either I was going to set a fast time or burn up. The latter happened and I finished the 88 miles in 4h 50m. Getting faster I thought, after all the goal was Ride London at the start of August. I was regularly leading rides for group for and now assisting group 3 rides as well as continuing the commute to/from work as often as possible during the week. I continued to soak up advise from experience club members and tried to implement these into my commuting rides. Various levels of success a long with trial and error lead to a continued level of improvement. It would be seen how far I had come on the bike with a three day visit to the Yorksire Dales, just before a ride London with a mate of mine Harv. It was a good trip lots of hills and they are steep and no suprise lots of rain. So much rain in fact even the locals said it was a lot of rain, one gentleman said “it ain’t rained like t’is round ‘ere for years”. After drying out we knew that our legs would cope with Leith and Box Hill that weekend. Ride London, the big event was here. Again this was a closed road event on the 2012 Olympic Road Race course, and the goal was to finish the whole course (the weather the previous year had lead to the course being shortened for safety) and to set a good time. I was on the front row of our starting wave and although this is not a race I made the decision to be first of of the Olympic park for our wave. The flag went down and I went for it, and achieved my little challenge, although I doubt anyone else was interested, but I was first into the A12 heading towards central London and the Surrey hills. In the previous wave a multiple world champion and 2 time Olympic Gold Medalist from 2012 was riding with her dad, yes it was Laura Trott. I had the pleasure of meeting her at the registration event on the Friday and said I wonder if I would see her again on the ride. Going through Richmond park I heard a very distinctive laugh (if you have heard Laura laugh then you know what ask mean) which had meant somewhere I had already passed her. I know she was not riding flat out but she want going slow either. I took my opportunity and drafted for a bit. I also managed to have a chat with her about her Rio preparations etc. and I noticed we were moving quite nicely at an average of 22.5mph, slow for Laura but quick for me. I intended to ride with Miss Trott for the rest of the ride as long as I did my turn on the front and all was going well until the first of three punctures. Laura was gone so I was back in the pack. My mate Harv stopped for a chat before we were off again. I admit I did go a bit faster trying to make to hub for some much needed pressure in the front wheel. All in all the work had paid off as I completed the 100 miles in 5h 15m with a nice average speed of 19.1 mph (group 1 pace!). The club entered a local charity sportive instead of running club rides one Sunday morning and we all joined in. My aim was to see how long I could stay with some of the sesioned club cyclists, and before long we had a large group, of about 30 riders, a mixture of club members and other cyclists. As the ride went on and the pace remained high (19-20mph) the group gradually got smaller. At 36 miles (of 50) I was starting to feel the pressure, but made a big effort not to be dropped and complete the ride with the remaining club members. At 41 miles I had dug deep but knew that I was going to finishwith the others and I did in 2h 32m. I reminder saying to Russ, that maybe he was right after all and I would be in group 2 by September. He was right as when the ride leader plan for Septmeber was emailed to us, there I was assisting group 2 at the end of the month. Leading the two’s was never a plan but on 27th September, the date I was supposed to be assisting this group there I was leading the ride. It was also my first group two ride, so added responsibility, and despite a few wrong turns everyone enjoyed the ride and we got back safely. Over a post cycle coffee, I took a moment to review my first seven months with a cycling club, what a journey. The following weekend was a challenge to ride the Trough of Bowland, which I have to say was very, no extremely enjoyable on and off the bike, but the climbing was harder than the trip to the Dales a few months before. One minute you are climbing at 5mph and then descending at 40+mph for three hours (moving time). However can’t wait to go back. So my first seven months as a member of my local cycling club has been fun, exciting, full of challenges and the opportunity to meet many like minded people, as well as my cycling ability/fitness come on in leaps and bounds. Just the motivation required for a good winter training set and to be ready for the start of 2016! Below is a graph I have used to track my fitness and to see my improvement. 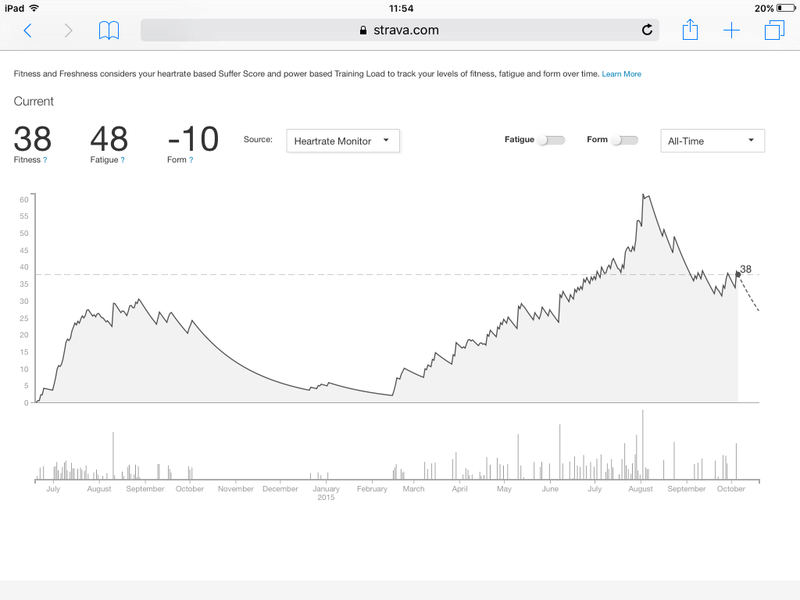 This entry was posted in Club rides, Cycling, Training and tagged Cycling, cycling technique, improvement, listen to advice, ride london, Toir of Cambrideshire, Trough of Bowland, walden velo, Yorkshire Dales.